Simple yet unique way of presenting About Me page. I usually have issues regarding your http and www links. It returns an invalid page. I know that being a blogger, publishing ads to earn is really tempting. But sometimes, placing too many ads annoys your visitors and instead of catching their attention, they will most likely leave your site. Inserting thumbnails on homepage gives more color to the page and makes it more attractive, but color isn't everything - uniformity also counts! The irregular shapes of each thumbnail makes it confusing. Though I can praise your way of hiding your advertisements through your page, I must say that majority of your sidebar tells nothing about your blog. The bad thing about ads is that you are actually trying to let people leave your site and since you hide it, they would actually think that the ad they click is still part of your site. I love the color blue since it gives a cool refreshing feeling. I do appreciate using that color but I don't think that it mixes well on your background. Based on looking at your codes, I've seen that you are using Norma Theme from WP and the default color is red. Red looks good on the background but unfortunately, I don't find your shade of blue (#0000FB) right for this. One thing I can say is you either tone that color down or change the background (the gray one). You have too many posts on the homepage, 10 in my count. Doing this creates a very long sidebar too that has too many spaces -- it looks unattractive. Google Ad at the upper part too looks annoying, the sticky one that floats above -- I don't like it! Not to mention that you have TOO many ads on per page basis. I find the menu too crowded. Well, you have great contents for a techie blogger. You give not only what your visitors need but also a personal touch on your posts by giving opinions. What annoys me is the presence of ads on your posts -- DUDE! You must be a millionaire by now. I'm actually counting the number of ads, you actually have per page. The front page has four google ads, two nuffnang and four churpchurps. The article page has - five google ads, one chitika, three nuffnang and four churpchurps. Not to mention the inline infolinks. What's worst is that they are scattered all over your page! Ninety percent of your sidebar is composed of advertisements! I love the logo and banner part. Though I'm pretty sure that I saw that avatar before from somewhere which made me think that this comes from a online generator. Now having that in mind, have you ever think that someone might be using the same avatar as you? 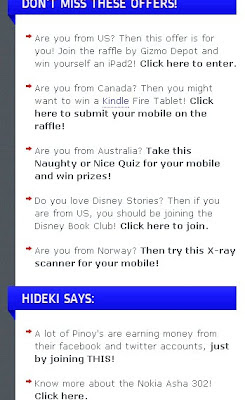 The banner "Ask Hideki", looks good. As well as the tag line, but it doesn't say anything at all. For me the tag line sounds like a personal blog rather than a techie one. I usually see this form of tag line in Personal blogs. Other variants of this goes like this: "Another blogger's blog", "Just Another Cliche", "Title Goes Here". There is nothing unique if you say "Just another..."
I don't get the idea of the favicon. It looks like a cellphone but more like a glass of water. Though I find your blog interesting and your approach similar to Karl's Daftcoder, I think the way it was package makes it a little dirty (I'm talking about design and the way it was posted). Overall, I MIGHT come back again. The content is ok, but the inline advertisement is not good, specially the ads on top which is not related to the content. It consumes space for the actual content. The side bar [on the left] consumes almost half of the page. “Related Results”, “You might also like” and “Related posts” right after the blog content consumes most of the spaces, and it is somewhat redundant, you should prioritize what to display. Though some of the contents lack technical information and background information. I find the blog interesting, and there’s a lot of content worth reading, so probably I will browse this blog site again. Well, majority of the things I notice is about the advertisements that was scattered all over the place. It's not bad to have multiple ads but sometimes too many ads create an unprofessional atmosphere that annoys your visitor. Though, this may sound a little bias since I'm on the field of technology, but your contents are really cool for me. Nice one! Actually naelib ako sa ad placement nya ah! Malamang mapaclick ako dun kung wala sa review mo hahaha.